The section on Structural Design covers matters such as pipe strengths, depths and bedding requirements. The section on Hydraulic Design covers matters such as pipe sizing and flow rates. Clay pipes and fittings which are produced to BS EN295: part 1: 2013 when installed in accordance with the enclosed installation instructions satisfy all the requirements of The Building Regulations 2010. The design and layout of a clay drainage system should be in accordance with the Guidance Documents listed in the Legislation and Standards section. The layout should be kept as simple as possible and the routes selected should make full use of the natural slopes of the ground or any adjustments thereto, so as to achieve the required gradients with minimum excavation. Changes of direction and gradient should be minimised. As the bulk of drainage is buried it is necessary to provide access to the system to allow rodding and the removal of debris. Both BS EN 752:2008 Table NA.20 and the Building Regulations Document H details recommendations for the siting and sizing of access fittings. Gradient – Pipes should be laid to even gradients and any change in gradient should be combined with an access point. Direction – Pipes should be laid in straight lines where practicable but may be laid to slight curves if these can be cleared of blockages. 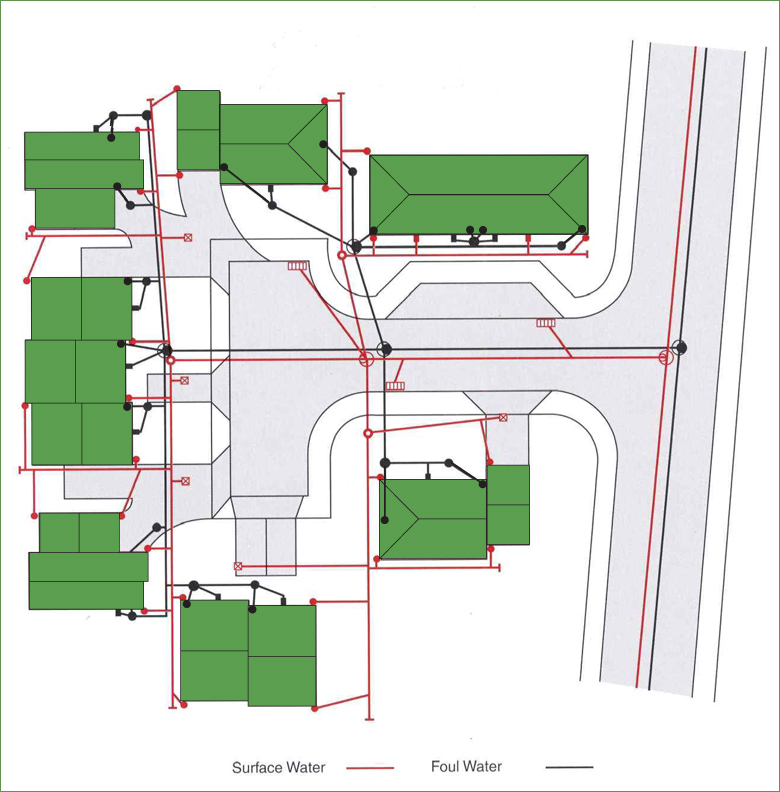 Junctions – Where practicable connections should be to inspection chambers or manholes but connections to junctions are acceptable if access is provided to clear blockage. In all cases discharge to be in the direction of flow at the point of connection. Bends – Bends should be positioned in or adjacent to terminal fittings, inspection chambers or manholes and at the foot of discharge stacks. Bends should have as large a radius as practicable. Ventilation – The system should be ventilated at or near the head of each main drain to allow free passage of air throughout, the maximum length of any branch serving a single appliance being 6m and for a group appliances 12m. Traps – Where appliances are not fitted with integral traps at the point of discharge a trap must be provided using either a trapped gully or low back trap. In addition a surface water pipe discharging into a combined system should be trapped. 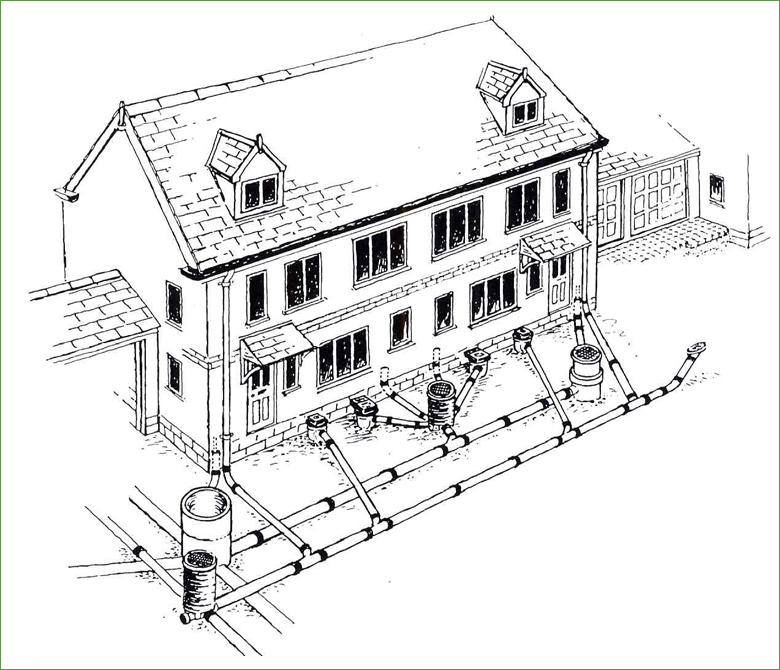 Special precautions should also be taken to accommodate the effects of settlement where pipes run under or near a building, on piles or beams, in common trenches or in unstable ground. Precautions may also be necessary in situations involving surcharging of drains, or where control of rodents is a problem. 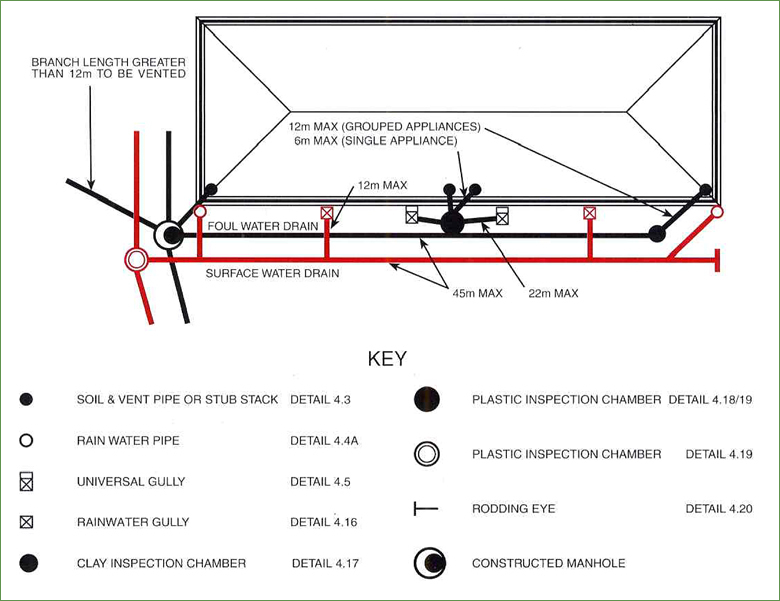 The diagrams above show suggested combinations of fittings for the connection of soil, waste and rainwater pipes to underground drainage systems. The layouts will satisfy the majority of drainage requirements, as well as complying with Building Regulations. However if the suggested layouts are not suitable for a particular application, the CPDA members offer a wide range of other fittings to fully satisfy any drainage design.